RVUNL JE Recruitment 2018 is released with huge number of vacancies. For 1151 Junior Engineer, Junior Chemists & Informatics Assistant Posts, this notification is released. From 14th June 2018 to 2nd July 2018, this Raj RVUNL Jobs Application Form is available @energy.rajasthan.gov.in. Rajasthan Rajya Vidyut Utpadan Nigam LTD(RVUNL) Full Notification is given below. So refer this page. For Rajasthan state people, check out this updated Rajasthan State Employment News. Graduates and Diploma Holders have been expecting this RVUNL Recruitment 2018 from a long period of time. At last, now their expectations are become real. Raj Government dept i.e. Rajasthan Rajya Vidyut Utpadan Nigam Ltdm advertised the RVUNL JE Recruitment 2018 along with Junior Chemists & Informatics Assistant Posts. Over all for 1151 Raj VUNL Jobs are released through this notification. Have the thought to appear for this Rajasthan state Government Job exam, then why late go and check the eligibility. Graduates and Diploma holders will like to work in their educational background field only. So now released RVUNL JE Jobs Notification is the one that is acceptable for any technical education studied candidates. For this RVUNL 1151 Posts Recruitment either Graduates or diploma pursued candidates in the mentioned discipline are the educational qualification wise eligible candidates. So first check the educational qualification only. Afterwards, you will know either you can be participant in this RVUNL JE Recruitment or not. If you are not, then try for other Sarkari Jobs as per your qualification. 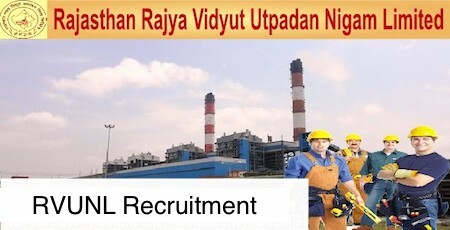 Rajasthan Rajya Vidyut Utpadan Nigam LTD has published an detailed RVUNL Junior Engineer, Other Posts Notification to give all the details to the job seekers who are wishing to become a competitor in this Raj RVUNL Recruitment. Willing contenders also first refer the official notification, then only check for the application link. Without the idea of the conditions or requirements of the RVUNL board, how can you know that this RVUNL Informatics Assistant Recruitment is suitable for you. So to know view the all posts educational qualifications, age limit. Junior Engineer: Graduation Degree in the relevant discipline from a recognized university. How to Apply for the RVUNL JE Recruitment 2018? Go through the Recruitments Options. Download the Full Advertisement of RVUNL 1151 Junior Engineer, Junior Chemists & Informatics Assistant Posts. Then Go to the Application Link in online. Save the submitted application form for future use. Fill the RVUNL JE Application [email protected]. Officials gave the time to fill the application form only up to the 2nd July 2018 end of the day. Afterwards, they won’t accept your application form even if you submit after one minute. So first complete the application process. Then engage in the preparation of previous papers. This was the over all information about the Raj RVUNL JE Recruitment 2018. A single specification from the notification is not missed in this post. All are covered here. Recruitment board will conduct the RVUNL Exam as a part of Rajasthan RVUNL Selection Process.